Ankara (AFP) - Turkish President Recep Tayyip Erdogan on Wednesday unveiled a new presidential palace on the outskirts of Ankara that has been denounced as an environmental blight and evidence of his autocratic tendencies. Erdogan hosted his first official event at the new palace, a ceremony congratulating dignitaries on the annual Republic Day marking the foundation of modern Turkey in 1923 out of the ruins of the Ottoman Empire. The complex, located in the Bestepe (Five Hills) area, has become known as the Ak Saray -- the White Palace. The immense project -- built at a reported cost of $350 million (275 million euros) -- has an area of 200,000 square metres (21,50,000 square feet), 1,000 rooms and architecture that is supposed to marry modernism and the traditions of the mediaeval Seljuk dynasty. However, Erdogan cancelled an evening reception at the palace because of a mining disaster in the southern province of Karaman that has left 18 miners trapped. "It would not be appropriate to hold this reception at such a time," Erdogan told reporters inside the palace, before heading to the scene of the disaster. According to Turkish media reports, invitations for the reception had been sent out to 2,500 couples. The palace will become the new home of the Turkish presidency, marking an historic break with the Cankaya presidential palace in downtown Ankara. Cankaya has been the seat of the Turkish president since the modern republic's founder Mustafa Kemal Ataturk became president and for many has been a symbol of Turkey's modern history as a progressive secular state. 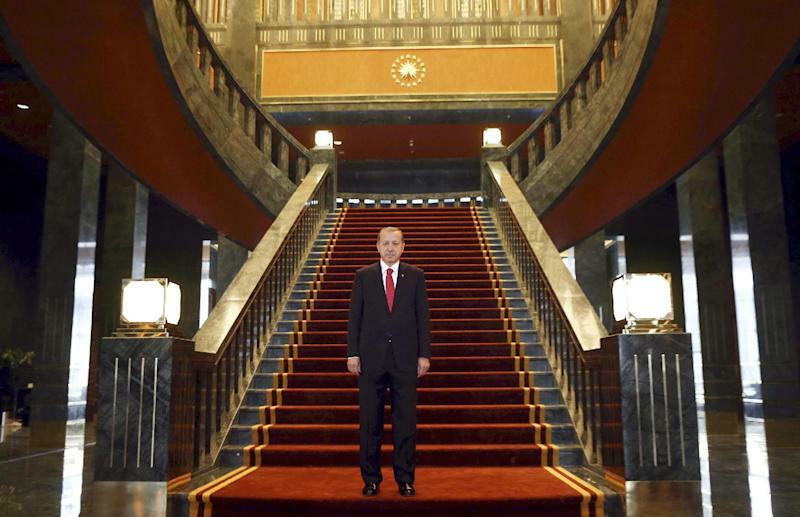 From Ataturk to Erdogan, it has been the home of 12 Turkish presidents. 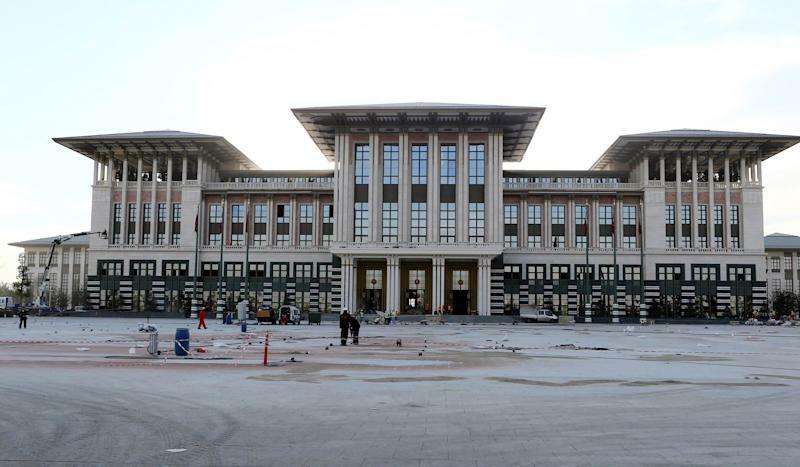 The move to the new palace is a vivid symbol of what Erdogan touts as his drive towards a fast-developing "new Turkey". "New Turkey is not the old Turkey," Erdogan told reporters last month as he returned from a foreign trip aboard his presidential jet, also a brand new acquisition. "The new Turkey should assert itself with something new. The presidential office has been arranged in a very special way, we have paid particular attention to this," he said. But for the opposition, the new palace marks another betrayal by Erdogan of Turkey's secular heritage bequeathed by Ataturk who based the republic on a strict separation of religion and state. 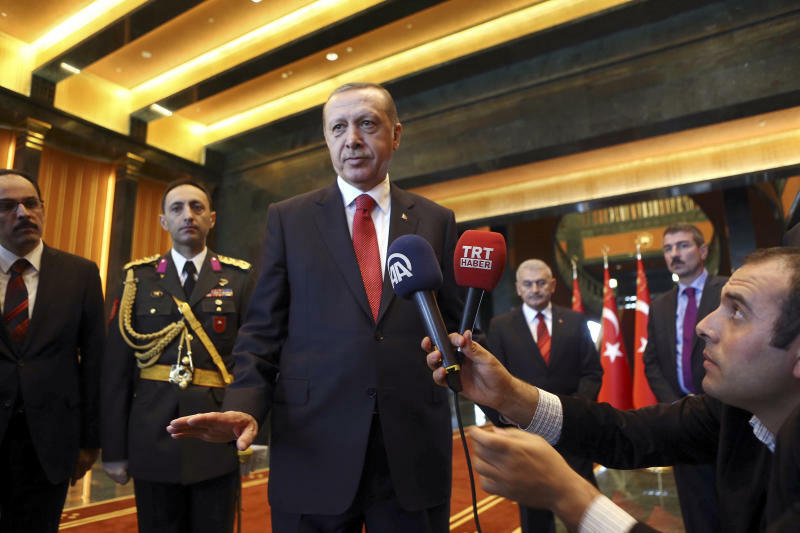 The opposition accuses Erdogan, who became president in August after more than a decade as prime minister, of imposing a gradual Islamisation and riding roughshod over Turkey's democracy. Erdogan has rubbed more salt into the wound by opening the palace on Republic Day, the dearest of all Turkish holidays for secularists. Umut Oran, a deputy for the opposition Republican People's Party (CHP), ridiculed the extravagance of the palace, saying that with the same funds Turkey could have sent "three satellites to Mars". "What could have been done with that money?" he asked, according to the Dogan news agency, claiming the presidency's budget was three times that of the British royal family. The Bestepe complex had initially been envisaged for premier but in the end Prime Minister Ahmet Davutoglu and his staff will move into the Cankaya palace. The name of the presidential palace, Ak Saray, is also a play on the name of the ruling Justice and Development Party (AKP) which is known to its followers as the AK Party. The post of president has been a largely ceremonial role in recent years. But Erdogan has vowed to wield real power, something he has clearly done in his first weeks in office. The new complex is also controversial among environmental activists because hundreds of trees were cut down to make way for it, even though it was one of the best preserved green spaces in the city. Furthermore, the palace has been built on land where Ataturk created a forest farm that was then donated to the state. Erdogan in March defied a court order halting the construction.